Great property. Fantastic beds, spacious rooms, nice pool and hot tub. Property was nice and clean. Pool was open 24hrs. Breakfast wasn’t very good. Where to find Moses Lake hotels near an airport? Where can I find hotels in Moses Lake that are near tourist attractions? 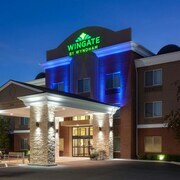 Visiting Central Washington and looking to reserve a hotel in Moses Lake? At the moment, Expedia's extensive database has 13 hotels to base yourself within a 0.1-kilometre (0.06-mile) radius of Moses Lake's heart. The Knights Inn Moses Lake, is an ideal choice for travelers as it is the most centrally located lodging choice in Moses Lake. Ephrata is another Moses Lake neighborhood that offers lodgings. Another options is to head to Ritzville and Quincy. In Ephrata, hotels include the Best Western Rama Inn and Knights Inn Ephrata. 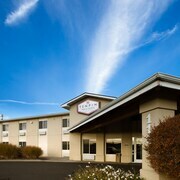 While Ritzville's hotels include the Best Western Bronco Inn and Cedars Inn & Suites Ritzville. Situated 45 kilometres (28 miles) from the center of Moses Lake, Quincy has a selection of places to stay which include the Knights Inn Quincy and Sundowner Motel. The Shilo Inn Suites - Moses Lake is conveniently positioned 4 kilometres (3 miles) away from the downtown area of Moses Lake and is excellent for travelers who like to stretch their budget. Visitors could also check out the rates at the Cedars Inn & Suites Ritzville. 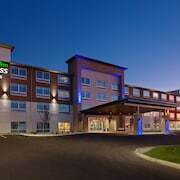 The Comfort Suites Moses Lake is located 4 kilometres (2 miles) from the main part of Moses Lake. Another accommodation option is the Holiday Inn Express Hotel & Suites Moses Lake, which can be found 4 kilometres (3 miles) away. 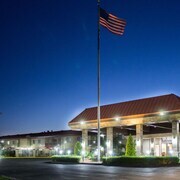 Some other places to stay include the Best Western Plus Lake Front Hotel and the Ameristay Inn and Suites. For those who are inspired to see some more of the mountains common in this area, you might also spend some extra days in other places in Central Washington. No matter if you enjoy common regional activities, such as rock climbing, hiking and camping, or just tour around to see the sights you will be able to book comfortable places to stay in the region. Ellensburg is 95 kilometres (61 miles) to the west of Moses Lake and is where you'll find Central Washington University and Ellensburg Rodeo. If you'd like to stay in Ellensburg, check out the room rates at the Holiday Inn Express Ellensburg and Best Western Plus Ellensburg Hotel. Alternatively, you could consider staying at Ellensburg, 95 kilometres (61 miles) to the west of Moses Lake, where you can choose from the Hampton Inn Ellensburg and Comfort Inn Ellensburg. The Wild Goose Casino and West Ellensburg Park are a couple of the most popular points of interest to check out while in Ellensburg. Our travel listing is also an excellent way to discover more about Moses Lake. What are the most popular Moses Lake hotels? Are there hotels in other cities near Moses Lake? What other types of accommodations are available in Moses Lake? Explore Moses Lake with Expedia.ca’s Travel Guides to find the best flights, cars, holiday packages and more!